These mini fryers present a new twist in presenting food. 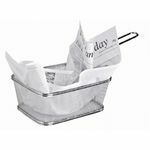 Also available to complete the these baskets are grease resistant paper with news print design or just brown craft inserts are available. Imagine serving a small portion of fries in these fryers, and watching the delight and suprise on your customers faces. The novelty factor make these a must have addition to serving options. Fryer Basket - 125mm x 100mm x 83mm has not been evaluated yet.